Jack Rosenthal was one of television's greatest dramatists who brought to his writing knowledge of and love for the everyman. His plays are witty, insightful, rich in irony and human observation. He has been described by one-time producer and director for both Omnibus and Arena Alan Yentob thus: "As one of the great original writers for television he is up there with Dennis Potter and Alan Bleasdale. His writing was funny and humane and touched a chord with millions of people." He began his career on the cobbles of Coronation Street in its formative years and went on to write plays based on his own experiences, starting with The Evacuees directed by a young Alan Parker. 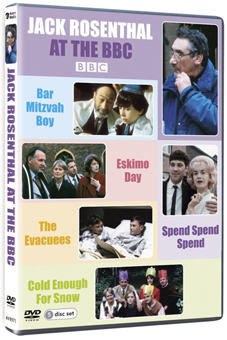 Five of his best plays, The Evacuees, Bar Mitzvah Boy, Spend Spend Spend, Eskimo Day, and Cold Enough For Snow were screened on the BBC's hugely successful long-running A Play For Today strand and although hugely in demand they haven't been available in any home video format until now. Capturing Rosenthal's talent at its peak, the plays feature a wealth of British acting talent, including Maureen Lipman, Maria Charles, Adrienne Posta, Jonathan Lynn, Alec Guinness, Cyril Shaps, John Duttine, Liz Smith, Tom Wilkinson, Anna Carteret and Laura Howard. All five plays will be released on DVD as a five-disc boxed set, Jack Rosenthal at the BBC, on 4 April 2011 courtesy of Acorn Media at the RRP of £35.99. The Evacuees (1975) – World War II has just begun and a Jewish School evacuates its children to Blackpool, but two brothers find a none-too welcoming new home. Bar Mitzvah Boy (1976) – Eliot Green is 13 years and about to undergo one of the most important Jewish rituals; his Bar Mitzvah, but he throws the ceremony and his family into turmoil making the day unforgettable. Spend Spend Spend (1977) – The dramatic story of Pools winner Viv Nicholson who won a huge windfall in 1961 and the devastating effect it had on her life and loves. Eskimo Day (1996) – Three sets of parents have to deal with the emotional upheaval of their children applying to Cambridge University and how their paths cross. Cold Enough For Snow (1997) – This is the irresistible follow-up to Eskimo Day in which we follow two of the families coping (or not) with life after their children have flown the nest.